PandaTip: PandaDoc’s tokens help you customize a proposal template in seconds without missing any fields. To customize this template, simply fill out the tokens using the menu on the right! [Client.Company] has expressed organizational challenges and goals that can be met through the implementation of a strategic HR program. [Sender.Company] is a full-service Human Resources agency, specializing in providing outsourced turnkey HR solutions to growing companies. This Human Resources services proposal includes details regarding the operational HR support that [Sender.Company] can offer alongside any associated service costs. This proposal includes two key sections- a-la-carte services and ongoing services. While a-la-carte services are available to [Client.Company] on an as-needed basis, ongoing services are those that will be required on a daily, weekly, or monthly basis, and are covered under a flat-fee retainer. PandaTip: Need to customize this template’s content? Simply click on of the content blocks, or drag new ones from the menu on the right. Well-documented HR polices and procedures are vital to a successful operating environment. [Sender.Client] is experienced in developing, applying, and evaluating HR policies and procedures for our clients. These services include maintaining accurate policy manuals, reviewing policy and procedure periodically, and updating documentation as needed. Taking the time to review performance and job satisfaction for every employee is an important part of maintaining an efficient, satisfied workforce. We offer employee review services that capture the quantitative and qualitative data relevant to each employee, and present that data in a format that makes it easy to understand overall trends and themes within the workforce. Locating qualified candidates to fill internal candidacies can be a daunting task, one with long-term implications for your company. We draw from over a decade of experience to ensure that your internal team remains staffed with qualified individuals who possess the qualifications and traits that fit your needs. [Sender.Company]’s Human Resources team will work with [Client.Company] executives and managers to constantly track, evaluate, and improve employee performance. We will provide HR support should any issues arise, and work with managers to develop performance improvement plans when necessary. Properly tracking and reporting financial data is important for a variety of reasons. We will manage all [Client.Company] financial responsibilities, including bi-weekly payroll, bonuses, and company cashflow. PandaTip: The pricing table above can be heavily customized to meet your needs. Try adding discounts, optional line items, and editable quantities! 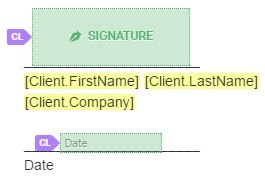 Once you send your proposal for outsourced HR services, your client will be able to sign below on any computer or mobile device. To indicate your approval of the outsourced HR services and rates listed above, electronically sign this proposal below.